Grand Theft Auto V is one of very, very few games that are so good that people who bought it on the Xbox 360 and PlayStation 4 are willing to buy it again for current gen systems and the PC. Today, the upcoming update has given us yet another good reason to do so: a new first-person option. The original version of GTA V was packed to the brim with content, with developer Rockstar pushing the previous gen systems to their absolute maximum. With the superiority of today’s Xbox One, PS4 and PC platforms, the developer has been able to implement better graphics, framerates, wildlife, and now, the ability to play the whole game in first person. We’ve always been in interested in it, but it’s never really been an option for us. I don’t think we could’ve put it in the [last-gen version] because we were too busy making the game. We were too busy working on our third-person controls and the missions. We were out of memory on the old consoles for animations. We were constantly fighting about what we could have and what we could still push in, and what other areas you could steal memory back from – audio, art, maps – for animation. So we could’ve added all the atoms to make a first-person mode to the level we wanted. We weren’t sure the world would have held up the way we would’ve wanted it to. In order to accomplish this groundbreaking feature for the series, Rockstar didn’t want to simply have the camera positioned at the player character’s eyes and call it a day. 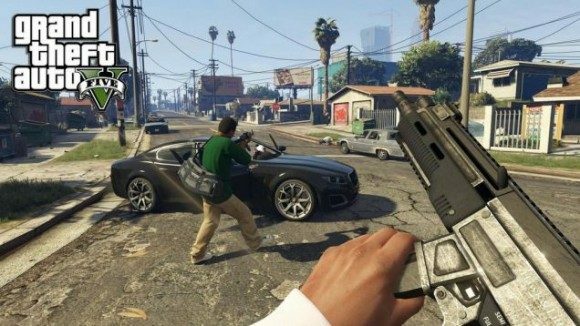 Instead, they worked extensively to adapt the GTA V engine to the new perspective, adding in details that previously were not there to ensure that this new feature felt like a fully-fledged aspect of the game and not a mod that someone cooked up in a few days. As a result, vehicles have speedometers, gas dials and radio displays that function properly, and helmets and masks will obscure your vision. You can also duck your head when being shot at while in a vehicle, and pulling out your phone will actually have you looking at the phone itself, instead of an overlay. Needless to say, the effect looks quite profound and it’s difficult to not want the enhanced GTA V to come out ASAP. Grand Theft Auto V will be out for the Xbox One and PlayStation 4 on November 18, while the PC version, which required extra polishing, has been delayed to January 2015.